Stringing Fool: Bead Soup is Served! 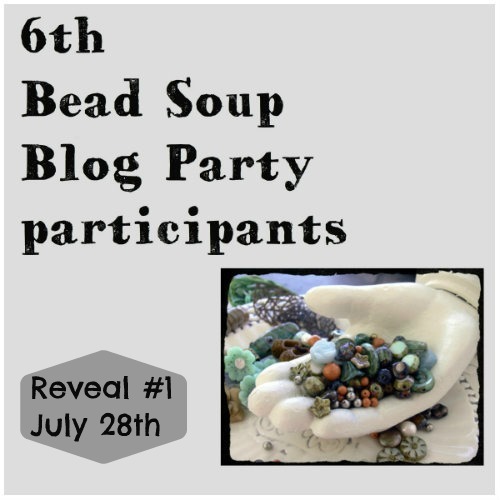 The big day has arrived for the Bead soup Blog Party first reveal. First, a peek at what I received from my partner Carolyn Lawson.. The focal is a rectangular glass pendant, complete with bail. 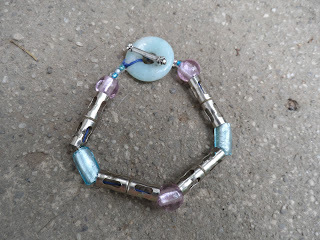 The clasp is a fancy silver toggle. 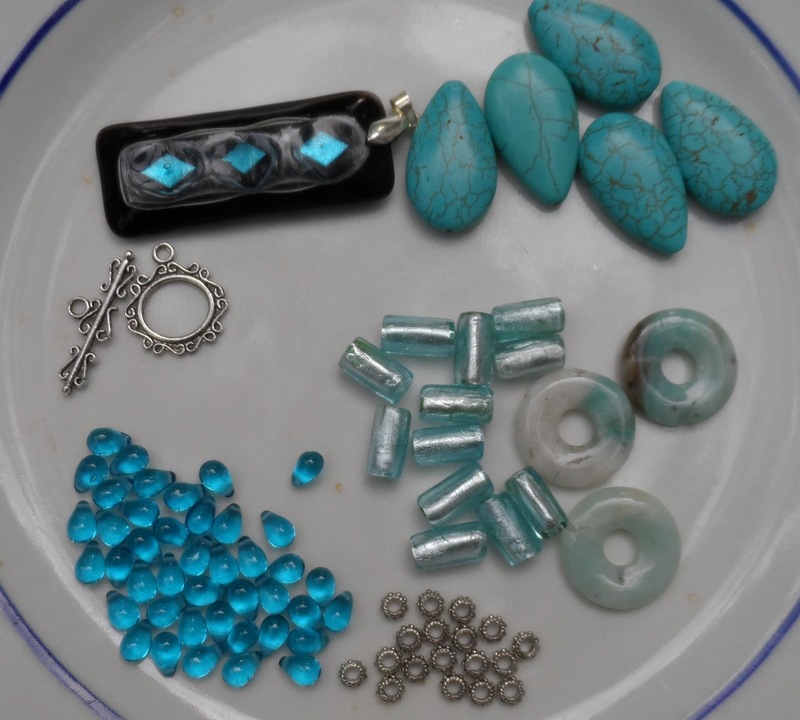 The beads include these giant blue howlite tear drop shapes, three donuts, and other shiny blue beads and some silver spacers.Lovely colors, interesting shapes. What to do? There is a lot here to work with, so I decided not to try to load everything into a few pieces. The Rhapsody in Blue Suite is Born! The pendant/focal was obviously destined to be a necklace. In it I used the little blue teardrop shaped beads, the foil lined bars, some of the spacers, and some seed beads from my stash. The streamlined look is completed by a small plain magnetic clasp. Here it is modeled by the lovely Haruko! Next, I made the bracelet that was screaming to be made from the howlite. One of the donuts looked good here, and of course the toggle clasp went perfectly. Some Czech glass beads from my stash rounded out the design. Two pairs of earrings came next, one utilizing the last of the howlite (so pretty!) 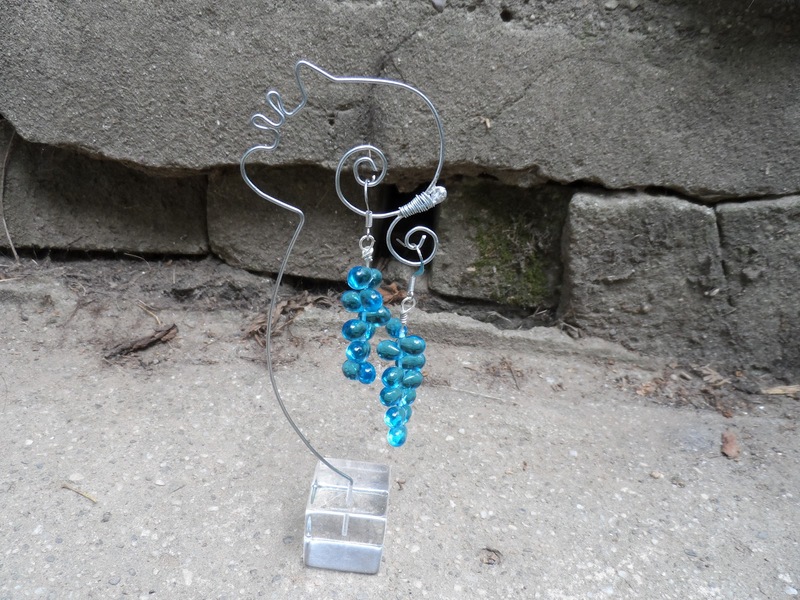 and a couple of the Czech beads, the other simply consists of the blue tear drops strung on head pins. A few days went by, and the idea for another bracelet presented itself. Strung on blue cotton cord, this one introduces some hardware from my "furnace collection" and some round pink foil lined beads to complement the blue ones. 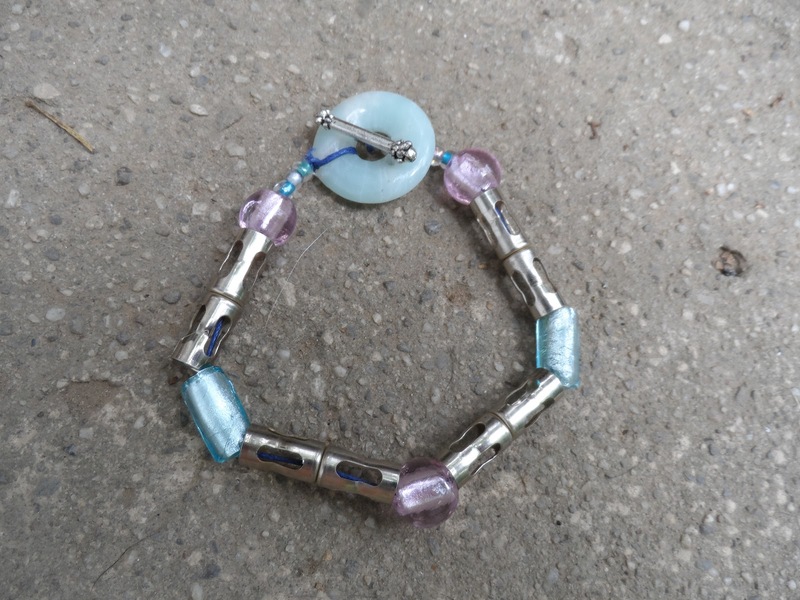 The clasp is made from a metal bar from a simple toggle, and one of the donuts. This has been a wonderful challenge and experience. 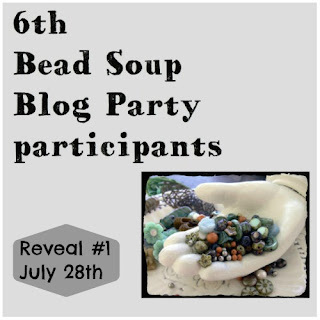 This is my first Bead Soup, but not my last! Stunning work! The focal in the necklace is stunning and you really created a necklace that works well with it. I know I would love to wear it! Love the cat model! What does he charge for a session? Ha! The tear drop earrings are simple but so effective. Well done! This is my first hop and not my last either. 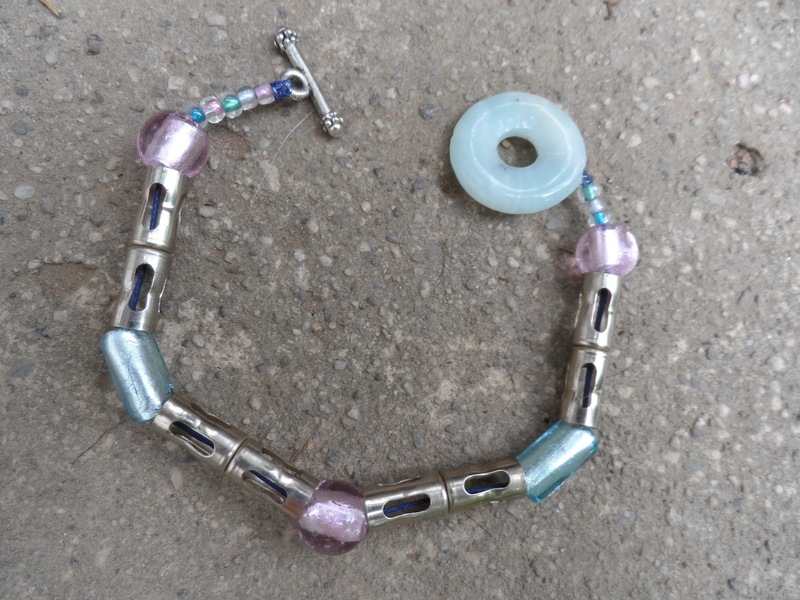 :-) Really nice pieces...I especially love the hardware bracelet! Nice grouping of beads and hardware... your pieces are all well done. Wonderful work - love the cat model! 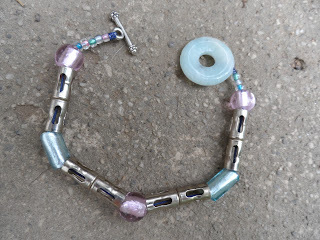 Lovely works...I really love the blue bracelet and the earrings! All of them are very nice. You have an adorable model there <3 Gorgeous pieces ! All fabulous pieces, but my fave by far is the bracelet with your hardware! wonderful pieces, and what a chuckle to see how happy your model is to be 'styl'n' your necklace! Beautiful work: you had a blast with your ingredients, haven't you? :) How did you convince your model to sit with a necklace on?! Very nice pieces! Great job with your soup! Beautiful pieces! My fav is the howlite. Love it! My fave would be the necklace, simple, yet effective design. I'd totally wear it with my "blue" outfits. Nicely executed - cute and adorable. Very pretty. I wish my cat would model for me, but it would be really hard to get a good picture from under the desk, which is where he would run if I put anything around his neck. Lovely shades of blue, and your creations from your soup are very pretty. Love the howlite bracelet! Great soup! Those blue tear drop glass earrings are SOOO pretty. And I love your model. Love all the variety you got with your pieces, like the different ways you used the donuts. Great job! I do so love blue! And, I really like your use of the donuts-those are hard for me! Beautiful! such beautiful shades of blue! I really loved the howlite bracelet, its bold and beautiful! the blues would have really thrown me, you did a great job! I love what you did with your soup. It seems that you did the best thing you could possibly do, you HAD FUN! Your pieces just screamed fun to me, and I love them! You have a very patient (and beautiful!) model! That pendant is gorgeous, and you did it justice! Thanks for playing, and I hope you'll do so again in Jan/Feb! LOVE all those blues! Beautiful pieces! Great job. I especially liked the chunky howlite bracelet! Mary Hicks, you really summed it up. I was not trying for anything more than jewelry I liked. And that is fun! okay, while all of these are beautiful,I LOVE those blue tear drop beads.. and the earrings you made with them are fabulous! I absolutely love those second earrings.. the tear drop beaded one. I also love how your cat helped out.. Great job. 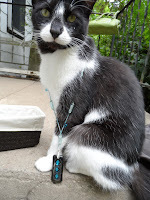 Wonderful pieces, and a very patient kitty model! What a beautiful collection of pieces - and kudos to the lovely Haruko, the cat model. I wouldn't let him wear it around the neighborhood though, the other cats will feel naked. You did a great job! Hey I really like the idea of using a donut as the clasp. Great idea!!! I also like how you used the tubular beads to compliment the focal. A job well done. Rhapsody in blue indeed! Quite nice! Blue is my favorite color! My favorite piece is the howlite bracelet... love them all! Wow I love everything you designed! Gorgeous work! I love the necklace. You certainly did justice to the focal! I just love your model and the necklace. My favorite piece however is the necklace where you used one of the donuts for a clasp. Turquoise is one of my favorite colors, nice soup. Blue in every shade and variation is my favorite. Your creations do not disappoint. PS love your model! Lovely work! The blues really came together. Pretty creations from a soup of pretty beads! Everything you made is very pretty.. blue my favorite color to wear! I like how you incorporated the donut into the clasp! You have a great model! :) The earrings you made are my favorite! really nice! 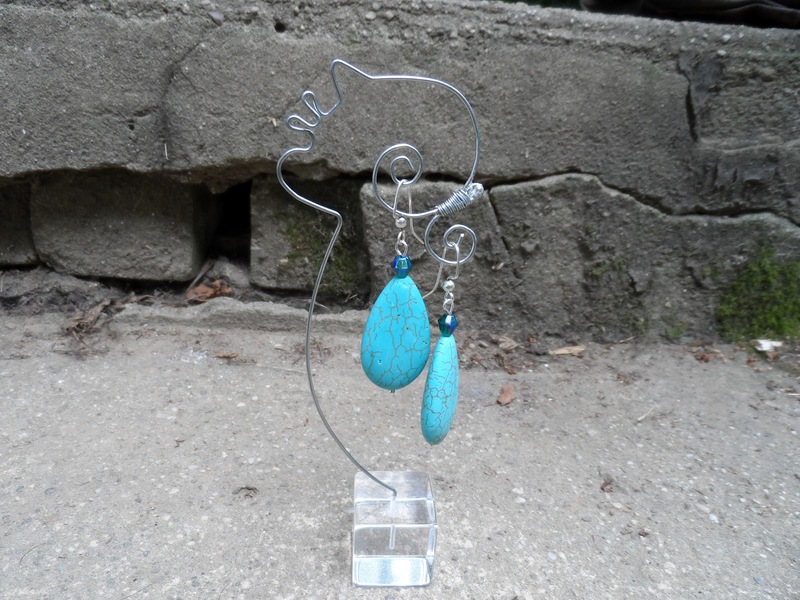 Great blue pieces, love the blue teardrops bracelet, and the earrings too. Lovely! 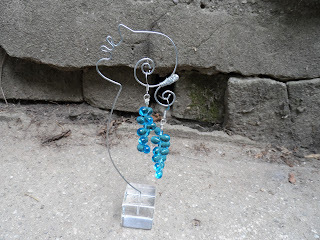 You know, I always feel like I never know what to do with blue beads, but you put together a couple of fabulous pieces of jewelry! Well done! Great focal! Love what you did with it! I absolutely love the necklace design. Very pretty. So awesome that your cat is a model, lol. I love the blue bead soup. It made for some interesting pieces. Haha, what a handsome model Haruko is! Congratulations on so many sweet pieces with your soup :) That really is a cool pendant on the necklace. Love the designs, in particular the blue drop earrings. Haruko is just the sweetest model! beautiful blues...one of my favorite colors to work with! I love your model. The jewelry is beautiful. I adore the bracelets. Your beautiful designs live up to the title you gave them ! Each and everyone is gorgeous. Love the Cat model ! Wow is your cat co-operative! My favorite are the tear-drop earrings. Love how you used that donut as part of a toggle clasp, too. Very creative! Wonderful creations! Love your model, I have wonderful helpers too! I just love what you did with that pendant. My cats are jealous! Also would love to call both pair of earrings my own! Beti,you did a great job with your soup! 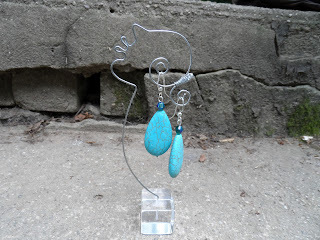 I especially love the bracelet and earrings you made with the teardrop turquoise. The creamy blue donut looks perfect with the turquoise. NICE! Very pretty, I love the first necklace with the glass focal and the pretty blue beads. Great job on all. Your model is just perfect for such a lovely piece. Haruko you're stealing the show! Such a pretty kitty! You got a lot of mileage out of your soup, great job! Haruko looks just lovely in that necklace! Great job on all those designs! Very fetching Model!!! So many pieces - you have been so creatively busy! I especially like the howlite drops bracelet. Rhapsody in Blue, indeed! I love the use of the doughnut as a toggle. Aw, kitty-head has bling! Love what you did with your soup! So much fun! What a fun post....I can't believe you got your cat to sit still long enough to model! lol Lovely work! 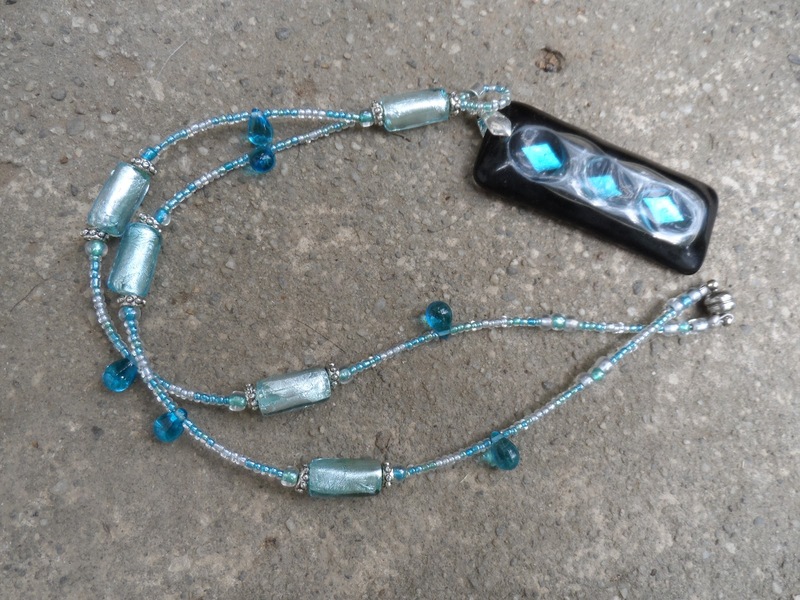 I really like the black & aqua necklace, but I think I would have used a little black in the strands also. I find it most interesting how you simplified stringing the glass focal but yet accented the color. Very nice choice. 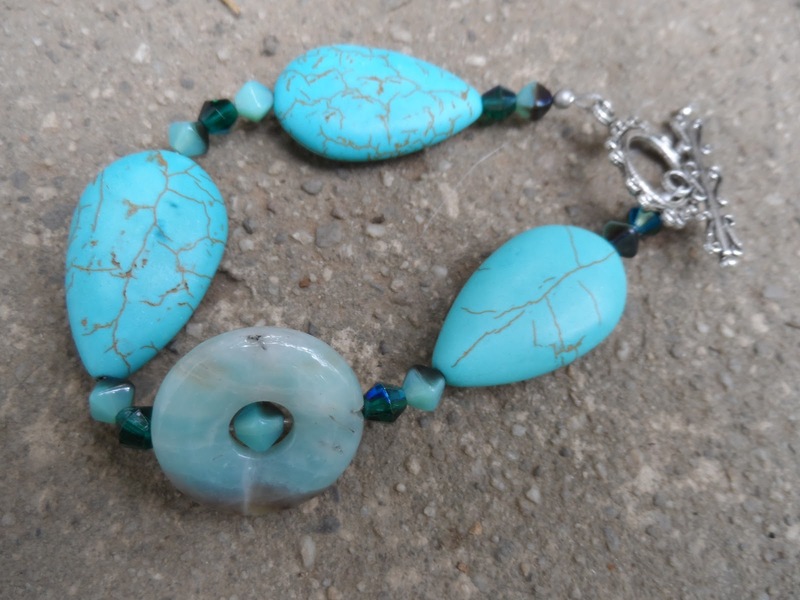 I absolutely love the Howlite turquoise bracelet and teardrop earrings. I just love that color! I love what you did with my beads. Not sure that I could have done as well. Thanks for the wonderful soup that you sent me. What a cool mix she sent you. I love the blue. You did a beautiful job with it. The earrings are pretty cool as well. The necklace looks stunning on Haruko! I like the first bracelet - it looks like it has a nice heft to it. You did a great job with all the blues that you received. I love what you have made here, the bracelet especially! Thanks for your comment. The hardware used in that bracelet comes from a box of stuff found at the Flea Market. The man had obviously had it marked for sale at $4.00 for a very long time. I offered him $3.00 because I coveted some copper wire spring thingies in the box. the challenge was finding a use for things like these stainless steel bars! And Haruko was just being Haruko! Your designs are great, beautiful focal. Did you know that you can make cash by locking special sections of your blog / website? To begin you need to join AdWorkMedia and use their Content Locking plug-in.